We take it as a given that buildings should operate as efficiently as possible. Efficiency is one of the foundations of sustainable design, affecting all aspects of a project, from siting, to space planning, material usage, and systems. Energy efficiency is central to current green design practice: the largest category of LEED points, for example, has to do with energy. And energy efficiency has a very long way to go: in recent years, overall building energy intensity (the amount of energy used per unit area, square foot or square meter) has not declined dramatically. State of the art buildings have made a great deal of progress in efficiency, but they are a small percentage of the total building stock. But for leading-edge buildings, energy efficiency is a process with diminishing returns. Generally, each new increment in efficiency will come at increasing cost, and energy use in most buildings will never – and should never – reach zero, since the (efficient) use of energy is one of the essential attributes of civilization. Light at night, refrigeration of food, communications, and computation for entertainment and work, are dependent on the use of energy. The paradigm shift of energy generating buildings. Though they are often seen as part of a continuum, energy generation is qualitatively different from energy efficiency. The techniques of energy saving are well advanced (though they have a long way to go), but the practice of on-site energy generation is in its infancy. Energy can be generated on site from non-renewable sources, like microturbines or fuel cells, which have efficiency and reliability benefits when compared to grid energy. However, true sustainability is based on renewable energy as the only clean source of energy. All real renewable energy comes from just one source – the sun – whether directly as light or heat, or transformed (with decreasing efficiency) into wind, hydropower, or biomass. In our work, we have concentrated on the direct use of solar energy in buildings, as solar offers technical benefits, and importantly for us, has architectural implications, as the basis of multifunctional architectural systems. The implications of integrated energy production go beyond individual building components. Energy generating buildings will lead to an operational and architectural paradigm shift, from total consumption to net production of energy; from minimizing and mitigating the external environment, to integrating and embracing it. BIPV is defined as solar-electric generators that are also part of the building envelope, or serve an architectural function. Kiss + Cathcart are pioneers in this field, having built some of the world’s first BIPV projects in the 1980s and 1990s, performed early research and technical studies for industry and government agencies such as the US Department of Energy and the New York State Energy Research and Development Authority, and designed and developed BIPV products and architectural systems. BIPV interests us for two reasons. First, for the architectural opportunities afforded by a productive building skin. Second, the economics: BIPV has the potential to be the lowest cost source of energy, period. 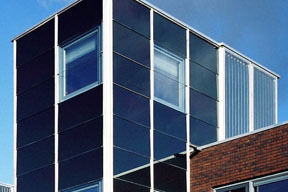 Some BIPV materials are inherently similar to architectural materials – thin film photovoltaics are physically almost the same as laminated architectural glass, for example – and ultimately the costs will be similar as well. 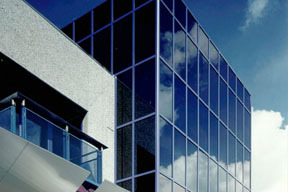 It is possible today to construct a BIPV curtain wall that costs less than a high end conventional facade. Done properly, BIPV can produce free renewable energy. In economic terms, the story of BIPV to date is one of unfulfilled promise. Rather than low or zero net cost, the vast majority of BIPV installations to date have been extremely expensive. The reasons for this are many, having to do with technology, the state of the PV industry, subsidy programs, regulatory issues, and lack of understanding by designers and developers. Nevertheless the potential is real, and completely economic, architecturally exciting BIPV projects can be done today. We can say this because we have built such projects as much as 20 years ago. The only renewable source other than solar that can be included in a building is wind (hydropower may have applications in some buildings, but it will be very rare that a building site has hydropower potential, whereas the sun and wind are available almost everywhere). Building mounted wind is a compelling idea to many in the green community, presenting a visible, kinetic expression of renewable power. 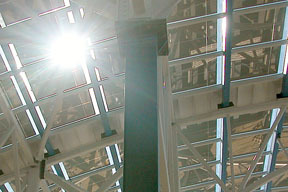 Unlike centralized equipment like microturbines, wind turbines are inherently visible, either directly (fully exposed) or indirectly (screened or ducted). In this sense they have strong architectural implications; but unlike PV, they have no potential for integration, which is defined as a multifunctional architectural element. For this reason we refer to Building-Mounted, not Building-Integrated wind. There have been a number of elegant designs that incorporate wind turbines in buildings; to us the problem with them is that the architectural integration is all cost and no benefit, the opposite of multifunctional PV cladding, for example. 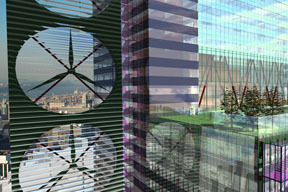 Wind turbines in these types of buildings occupy space that cannot be used for any other purpose, may inspire costly aerodynamic manipulations of the building massing, and create issues involving noise and vibration. A more fundamental problem with building mounted wind turbines is that often they will not work well. Wind is a highly site-specific resource and in an ideal location (offshore, mountain ridges) produces very economical electricity. Wind is highly sensitive to turbulence, however, and urban and built-up areas are very disruptive to air flow. Despite these issues we are very interested in the potential of building mounted wind. In our 2020 Tower project, which is designed to be energy self-sufficient in a very dense urban environment, we were able to generate only about 2/3 of the project’s energy from the BIPV facade and glazing. Assuming that a very tall tower (150 stories or 700m+) would have a good wind resource at the top, we included a large array in the upper 20% of the building. Without actual monitored results we cannot be sure whether even this configuration would work effectively. 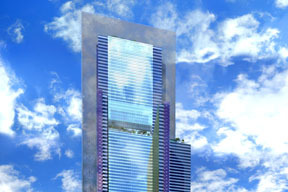 We remain interested in the idea but are skeptical about the feasibility in most cases. (see Environmental Building News on the subject).